TRAGEDY hit a family in Chisuma area outside Victoria Falls town on Monday when an elderly woman collapsed and died soon after the burial of her brother’s wife. The family has said it was still in shock following the death of Mrs Evelyn Sibanda (70) who had appeared calm during the funeral wake and burial at Jabula Village, BH57 under Chief Mvuthu. Mrs Sibanda was among mourners at the burial of her brother’s wife only identified as Na Rabby when she collapsed and died on Monday. A relative who identified herself as Mrs Sithokozile Mpofu said Mrs Sibanda and Na Rabby were close. “Mrs Sibanda did not look sick at all. She looked strong as she comforted others throughout the funeral. Instead she mourned in silence because she didn’t scream the way others were doing. “We were shocked when she suddenly collapsed at a nearby field on the edge of the yard where she had gone to get sweet reeds and pumpkins for mourners who were supposed to travel back to Bulawayo,” said Mrs Mpofu. 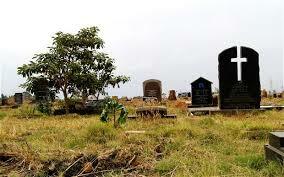 Scores of mourners rushed to render first aid but to no avail as Mrs Sibanda was already dead. “She had a strong bond with her brother’s wife such that we suspect that this could have affected her. People rushed but we couldn’t save her as she was already failing to breathe. It’s sad that we lost two family members in a space of two days,” said Mrs Mpofu. She said Mrs Sibanda’s body was taken to Mpilo Central Hospital in Bulawayo for a post-mortem. Jabula village head Mr Robert Mpofu confirmed the incident.